While the Church of England was preparing to lead the nation in a corporate commemoration of the 100th anniversary of Armistice Day 1918, the National Secular Society issued a tweet. 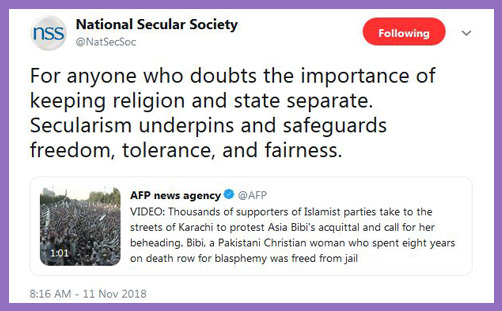 It shows hordes of Islamists marching through the streets of Karachi, baying for the blood of Asia Bibi who was acquitted of blasphemy and has now fled to the Netherlands to escape certain death at the hands of those whose judgment is more attuned to Mohammed’s scimitar than to natural justice and the rule of law. “Blasphemer Asia has been freed!” they cried. “The people’s court gave its verdict against her! Pakistan’s people’s court has turned down the Supreme Court’s verdict!” And so the people must have their way, and they want the head of Asia Bibi served up an silver platter. Forget Pakistan’s Supreme Court: Allah is the supremest – especially when mediated by mob sharia. You might think it astonishing, on a unique day commemorating the 100th anniversary of the signing of the Armistice – or perhaps on any Remembrance Sunday – for a national organisation to seek to detract from the honour which the whole nation is paying to its glorious dead. The President of Germany Frank-Walter Steinmeier attended the Cenotaph for the first time, and laid a wreath which bore a hand-written message: “Honoured to remember side by side, Grateful for reconciliation, Hopeful for a future in peace and friendship.” That evening he bowed his head to the Queen and shook her hand in Westminster Abbey in a deeply moving act of contrition and humility. This was the Supreme Governor of the Church of England radiating peace and working for reconciliation, but the tolerant and fair National Secular Society thinks she leads a church which is on the cusp of marching through the streets of London to demand the heads of blasphemers. It is tempting to issue a warning: “For anyone who doubts the importance of keeping secularists out of the state. Secularism or statist atheism underpinned or underpins the murderous militant regimes of China, Cuba, North Korea and Vietnam; not forgetting the liberty, equality and fraternity of France, Spain, the Soviet Union, Cambodia under the Khmer Rouge, East Germany and Mongolia.” Has any secular state ever imposed its notions of freedom, tolerance and fairness without chopping off the occasional head? Or will the National Secular Society simply say that these aren’t actually secular states; that rather like socialism in Venezuela, they aren’t quite doing it right? Consider the grace of the Archbishop of Canterbury and his sermon at the Armistice Centenary Service at Westminster Abbey. Read of the dignity of Archbishop of York and his service of Remembrance in York Minster; or the Bishop of London leading the nation at the Cenotaph. Read all about the Church of England doing what the Church of England does best, in the Guardian, Times, Telegraph, Sun, BBC, Independent, Daily Mail, Daily Star, Standard and Express. Not one Anglican horde anywhere baying for blood; not one rogue Anglican preacher anywhere exhorting hate and division. Just abundant love, peace, reconciliation and the embodiment of national unity. There are many cogent arguments for the disestablishment of the Church of England, but the fear of the Dean of Westminster leading the Abbey’s congregation to the gates of Parliament and demanding the head of Theresa May isn’t one of them. If you want to see true English notions of freedom, tolerance and fairness fused with spiritual responsibility, pastoral care and the benign channelling of God’s grace into the temporal aspects of society, then look no further than the mission of the Church of England; the incarnation of the common good. If you believe the Established Church presents a danger on par with Pakistani Islamists, then you seriously need to re-think your understanding of religious welfare and temporal peace; and reconsider your mission strategy of communication and persuasion, because it is patently absurd.